a blog about life, love, and simplicity. Posted on July 30, 2014 by Jennifer B. Last week, I used my first day off for my new schedule to execute a freezer cooking day! A freezer cooking day is basically meal prep on steroids (the prepping, not the meals). In the past, I’ve done one hour or an entire afternoon of freezer cooking sessions, but never have I undertaken so much in a single day. It saves time. Oh no! It’s 4:00 and you haven’t started dinner? No problem. Just pull something out of the freezer, throw it in the oven, make a salad, and you’ve got dinner ready. You can also double or triple batches of certain recipes in the same amount of time it would take to make one! It saves money. How many times do we order take-out or go through the drive-thru because it’s easy? Think of how expensive it is for a family of 4 to eat out. Homemade meals can be time consuming to make, but eating at home is a proven way to save hundreds of dollars a month. Many times we’ve had weeks where we’ll “eat from the pantry” in order to stretch our grocery budget. Since I’d been stocking up on pantry essentials for a few weeks now, I was able to plan my freezer cooking menu around what I had on hand. I spent less than $40 on my groceries that day. It saves your health. Convenience foods are expensive and terrible for your health. Yes, you can take a frozen pizza and have it ready to eat in 20 minutes. You can microwave Hot Pockets, Lean Cuisine, frozen burritos, etc. and have a hot meal in minutes. Those foods are packed full of preservatives and chemicals that wreak havoc on your body, not to mention how a serving size just isn’t quite enough to fill you up. By preparing homemade meals, you can avoid a large portion of those chemicals and have delicious, filling, and healthy foods available to eat at any moment. How did I plan my freezer cooking day? I started by scouring Pinterest, cookbooks, and websites for freezer-friendly recipes. Most tutorials on freezer cooking involves making dinner recipes. Since I usually don’t have a problem planning dinners, my main focus was to find recipes that my husband would like to eat for breakfast, lunches, and snacks. The day before my cooking day. I printed out this freezer cooking planner pack from Money Saving Mom for planning my day (hint – print enough copies of page 2 so you have enough recipe cards for your plan OR just print out each recipe so you have it on hand). I came up with about 30 recipes to try, which is far too many to attempt in one day. After I wrote down all my ideas, I ran them past my husband to see what he actually wanted to eat. This helped me bring my list down to 15 recipes (still a lofty list for one day of cooking by myself). When I settled on my final list, I printed out each recipe individually so I wouldn’t forget any ingredients. I decided to do my cooking day at my mom’s house, mostly because of her larger kitchen (along with the many dishes I would need), but also because she has a dishwasher! The morning of, I started loading up my car at about 7am and headed to her house by 7:30. I had a rough idea of what ingredients I needed, but I hadn’t made a final list. I made a list on the computer, added up like ingredients (i.e. 6 cups of shredded cheddar cheese for the day instead of 3 recipes with 2 cups each), compared that list to what I had on hand, and came up with a final list of what I needed to buy. List in hand, I headed out to Winco to buy my groceries. In case you missed it before, I spent less than $40 because of stocking up ahead of time (I even have extra sugar, flour, and yeast leftover for next time)! I was able to return within an hour to start cooking. After processing the dishes, I started on my cooking. Now, I didn’t keep an accurate record of what time I started each recipe, but I basically cooked from 10:15am till 9:30pm. I took an hour lunch break around 2pm, ran the dishwasher 4 times, and finally got home at 10:30pm after cleaning everything up. I had a 15-hour day! Look what I came out with after my long day! If you consider the $38 I spent on groceries, it breaks down to $0.28 per meal NOT including the pumpkin puree and jam. If you count the puree and jam as one “meal” each (making the total 148 meals), it breaks down to $0.27 per meal. Either way, it’s a huge savings! Phew! This was a long post. Thanks for sticking with me! Have you ever tried freezer cooking? What’s your method? 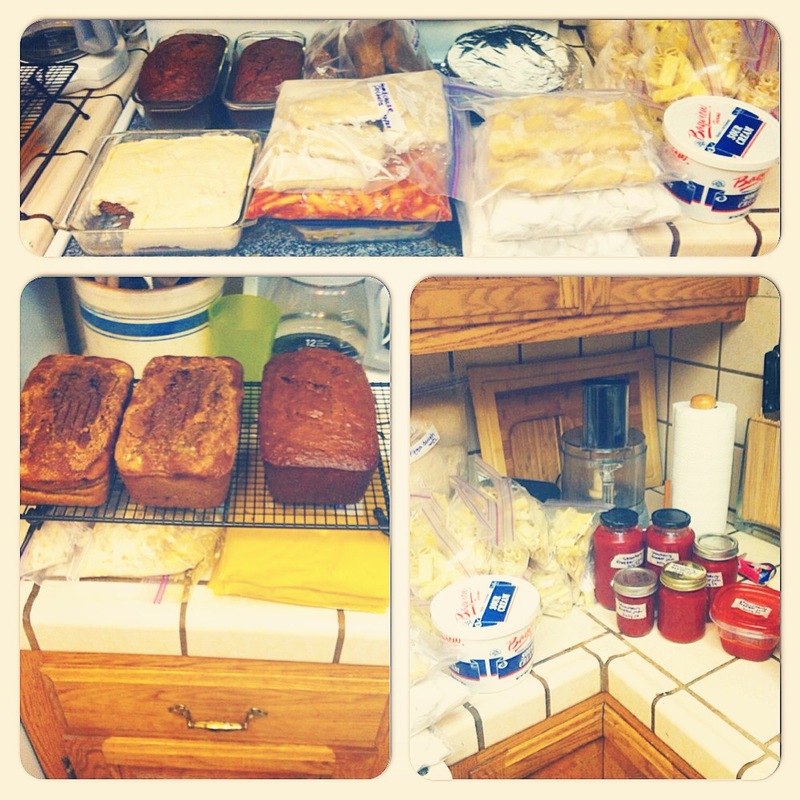 Posted on July 28, 2014 by Jennifer B.
I’m back to meal planning! I did plan out our meals for last week, though I never posted about it. We’re going out of town this weekend, so we’re eating out of the freezer/pantry. Friday – Sunday – Cabin trip! Posted on June 23, 2014 by Jennifer B. Happy Monday! I worked on planning menus for a few hours yesterday. I got this week’s and part of next week’s menus finished. I’m trying to go back to healthier choices, concentrating on more whole foods and recipes from the Tone It Up Nutrition plan for 75% of each day. I consciously choose dinners that are healthier, but still are meals that my husband would enjoy. We also have lots of special events this week, which made planning dinners easy! Wednesday – Anniversary date night! Posted on June 16, 2014 by Jennifer B. Time for another Menu Plan Monday! Last week, I was sneaky and planned two weeks of menus at a time. It took a little longer, but the tradeoff is that I only have a few groceries to buy this week. This week is going to look really similar to last week’s menu. Posted on June 9, 2014 by Jennifer B. Welcome back to Menu Plan Monday! Oh how I’ve missed these posts! We’re doing well going back to our cash envelope system for purchasing groceries, and I’ve been back to planning weekly menus for the last few weeks. Although planning weekly menus is extremely time consuming for me, I find that it saves us money, I can use what we already have on hand, it keeps us from eating out too often, and we eat healthier meals. It’s a win-win-win-win! I plan meals from Monday to Sunday. That way, I can use some of my time on the weekend to plan for the next week. My usual strategy is to rotate breakfasts, snacks, and lunches between two or three options during the week. This helps cut down on the amount of ingredients I need to buy each week. I try to change up dinners each week. If a recipe makes more than I know we can finish, we take leftovers for lunch or I plan a leftover night. I’ve been planning one slow cooker night each week, and I try to rotate in one or two new recipes to try each week. This week, my husband has requested homemade pizza, burgers, ravioli, and lots more salads. I happily obliged. Posted on May 30, 2014 by Jennifer B. 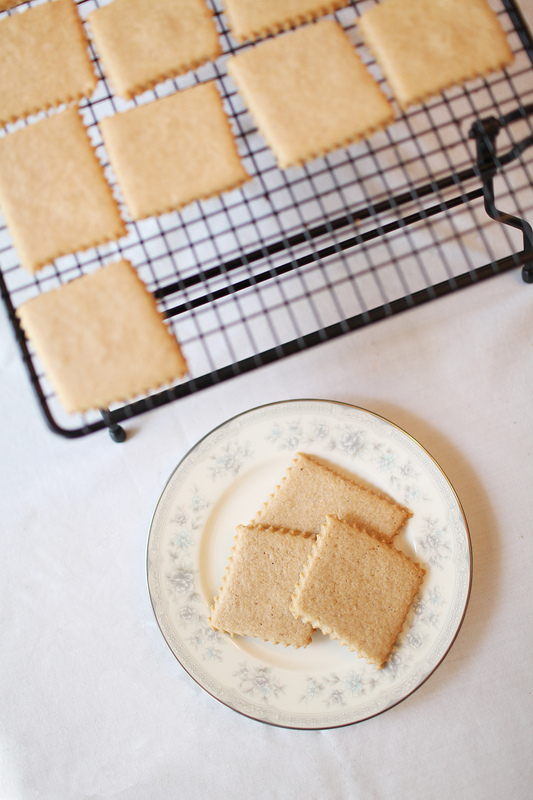 This is the final recipe in my Elizabethan cookbook series. It seems fitting that the last recipe be the one that inspired the whole project. We had just read Henry IV Part I in my Shakespeare class. Falstaff’s favorite drink in the whole world is sack, which is a type of wine. I was driving home and thought about adding booze to a custard for a more flavorful dessert. I remembered the quote from above and thought, “Sweet Jack…..DANIELS.” And thus, the inspiration for this recipe was born. Most of the other recipes in the cookbook were adapted from other recipes I’d found, or were adaptations of recipes from Shakespeare’s time. This was the one recipe that I created completely on my own. I did watch a few tutorials for making custard on YouTube while doing my research, but this recipe is 100% mine. In a small saucepan, combine almond milk, whiskey, vanilla, and cinnamon stick. Bring to a boil and then reduce heat to low. Whisk in corn starch and simmer 10 minutes, stirring occasionally. Turn off heat and let it cool another 5 minutes. Remove cinnamon stick and discard. Combine egg yolks and sugar in a large bowl. 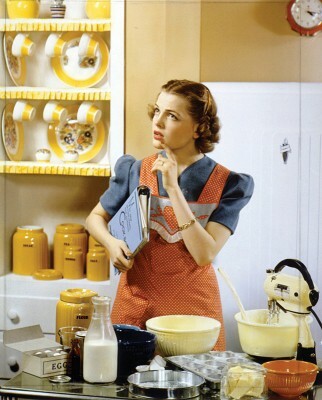 Once milk mixture has cooled, add to egg mixture slowly, whisking to combine thoroughly. Pass mixture through a strainer and discard any cooked egg chunks. 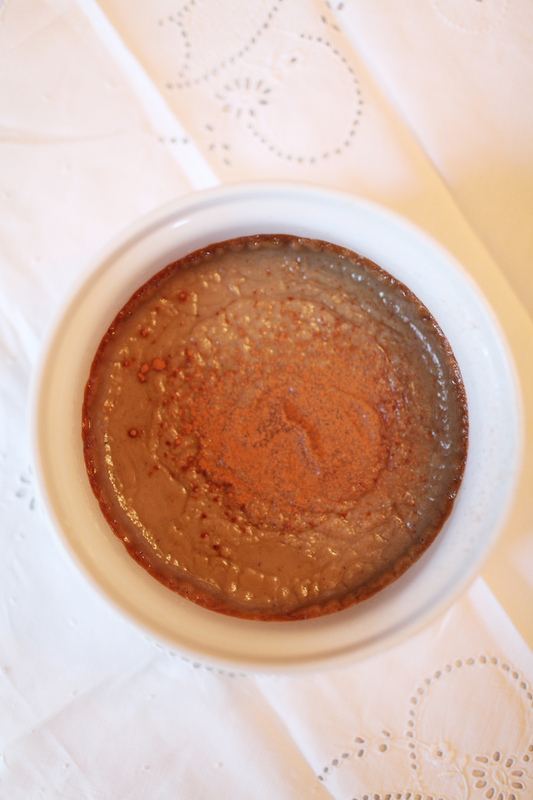 Spoon mixture evenly into 4 ramekins and top with ground cinnamon. Can be served either hot or cold – either serve immediately, or place in fridge until chilled. Posted on May 28, 2014 by Jennifer B. Recipe adapted from original 1808 recipe. Cut sugar and butter together. Add in rosewater and eggs and beat until smooth. Mix flour, nutmeg, salt, and cinnamon in a separate bowl. Slowly add in to wet ingredients until it forms a ball. Wrap in plastic wrap and refrigerate for 30 minutes. Roll out dough on a floured surface to ¼” thick. 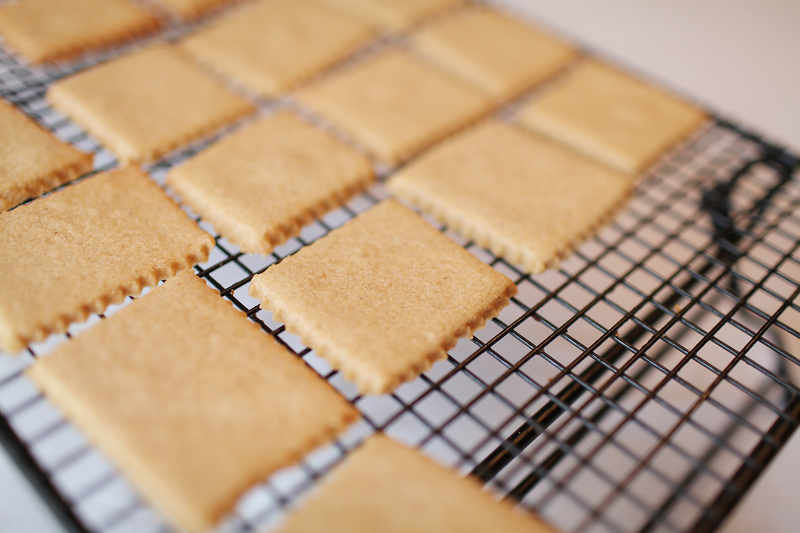 Cut with cookie cutters or a pastry cutter. Bake for 15-20 minutes and transfer to a cooling rack. Posted on May 23, 2014 by Jennifer B. Chicken was a popular food in Shakespeare’s time, but they weren’t tripped out on growth hormones like they are today. They would have been small, so I chose Cornish hens. 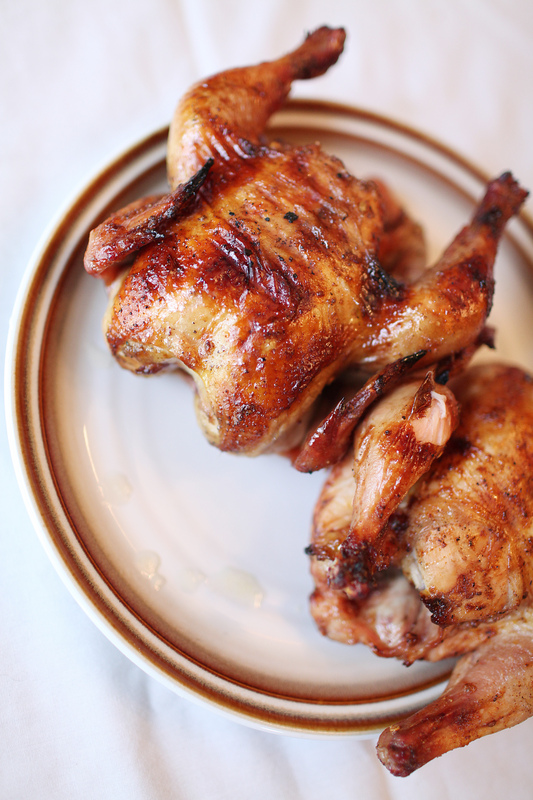 I love roasted Cornish hens stuffed with Rice-a-Roni. It’s a classic in my family. For this recipe, I wanted to try something different. 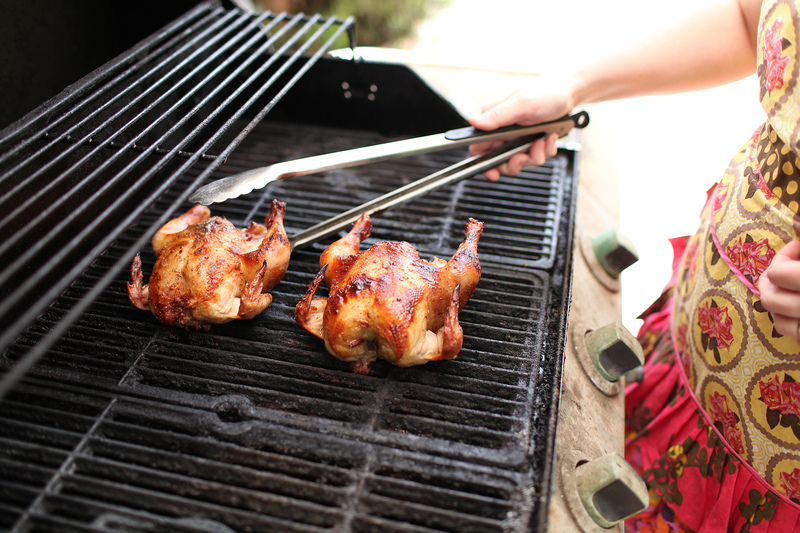 Grilled Cornish hens! You could definitely stuff the hens if you wanted, but that will increase the cooking time. Mix together brown sugar, paprika, allspice, garlic powder, salt, pepper, and crushed red pepper flakes, set aside. Working from the cavity end of each hen, run your fingers between the skin and flesh of the breasts and legs to loosen the skin without tearing. Push half of the butter under the skin and massage from the outside to spread the butter evenly over the breasts and legs. Spread the remaining butter over the entire surface of the hens. Rub seasoning mixture over the skin evenly. Grill over indirect high heat (450° to 550°F) until the juices run clear and the meat is no longer pink at the bone, 55 to 75 minutes. Remove the hens from the grill and let them rest for about 5 minutes. Serve warm (possibly with stuffed artichokes?). Posted on May 21, 2014 by Jennifer B. This was my absolute favorite recipe from the entire book. Artichokes are, hands down, my favorite vegetable. I love them on pizza, in dips, or even just steamed and dipped in melty butter. This recipe is a multi-step process. Even though it’s labor and time intensive, it’s totally worth it. Preheat oven to 375. Rinse artichokes. Remove stems and cut off the top 1/2-1 inch of artichoke. Trim remaining leaf tips if sharp. Scoop out the fuzzy insides (this takes a bit of muscle, especially when the artichokes are raw). Place upside down on a vegetable steamer in a large pot and fill with water to an inch above the steamer. Steam for 20 minutes. Remove artichokes from pot. Let drain upside down for 10 minutes. In a large skillet, heat 1 tablespoon of olive oil and 1/8 cup butter. Add chopped garlic, bread crumbs, salt, and pepper. Stir until mixture comes together. It will most likely be dry, so add the remaining oil and butter. Add in the cheese and stir until lightly golden brown. 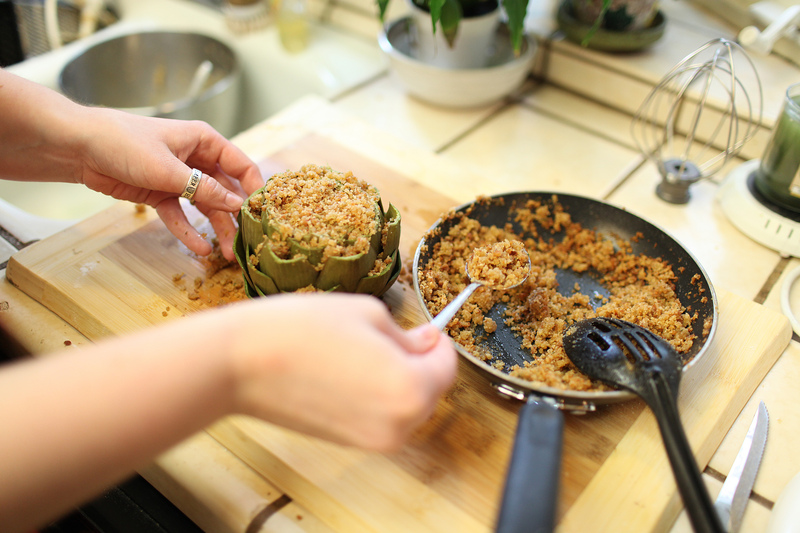 Gently pull apart artichoke leaves and generously spoon breadcrumb mixture evenly inside. Make sure to get the leaves on the side as well. 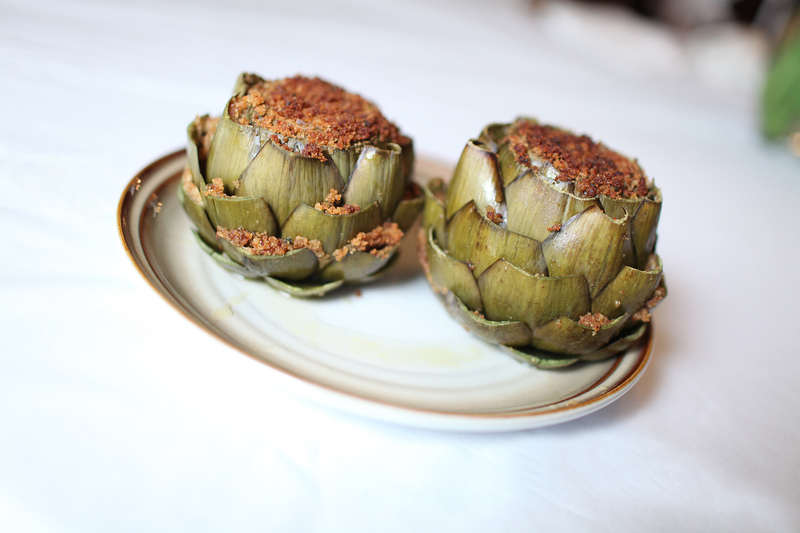 Place artichokes in a baking dish and add 1 inch of water to the bottom. Bake for 15 minutes uncovered. 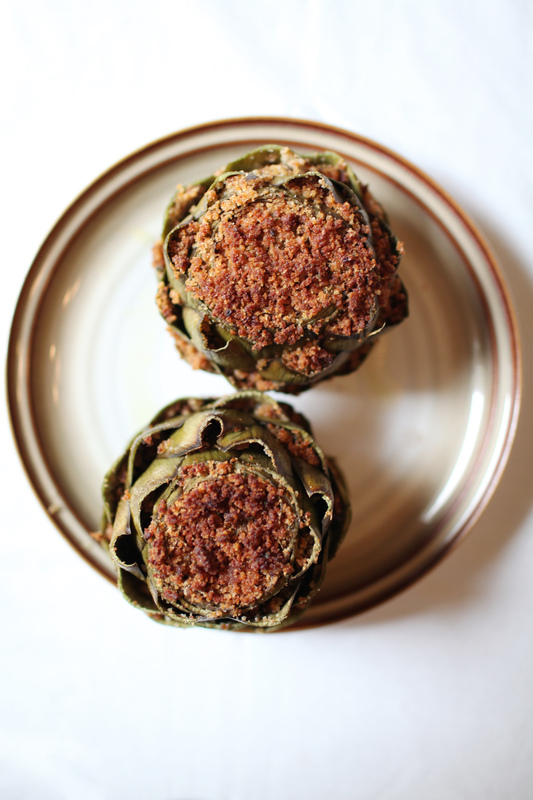 Place foil over the artichokes and bake another 25 minutes. Serve with melted butter. Posted on April 11, 2014 by Jennifer B. Prove this a prosperous day, the three-nook’d world shall bear the olive freely. This flavorful bread is great with melty butter. YUM. 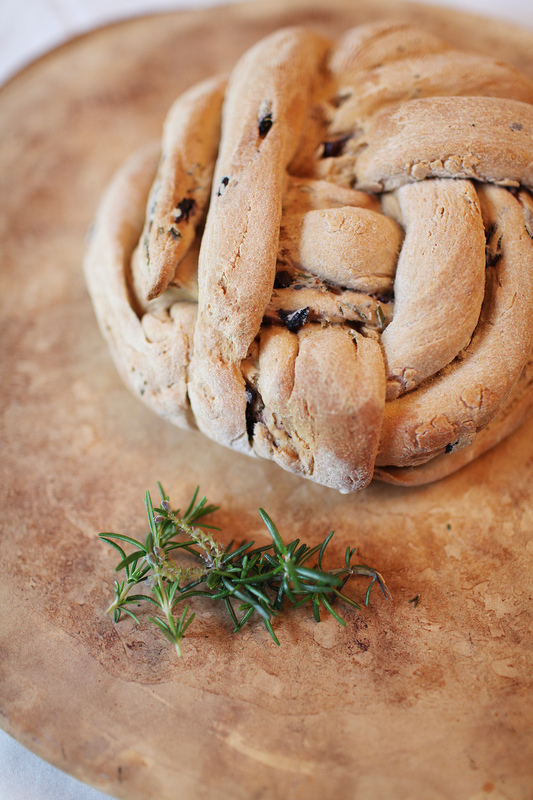 Mix chopped olives and rosemary into dough. If you want it to be super flavorful, go for the larger measurements. If you prefer a simpler flavor, add in the minimum. Form into a round, baguette, or try a braid. Bake 30-40 minutes. Transfer bread to cooling rack. Tutorial with pictures for the Winston knot (pictured above) found at Fig Jam and Lime Cordial.